There’s nothing scarier than the unknown. Except, perhaps, the unknown lurking just beyond your visual periphery, waiting to reach out a bony hand to visit all manner of terror on your physical and mental being. Or maybe just to give you a good scare. Edward Gorey provides a perfect example of this principle. The artist/author’s most famous work, The Gashlycrumb Tinies, introduces and summarily offs 26 children in the space of 13 rhyming couplets. The book would be a ghoulish endeavor, if not for the way its characters’ deaths are treated as utterly mundane—“Z is for ZILLAH who drank too much gin,” as if the little tyke were played by W.C. Fields—and either pictured shortly before or just after the fact. A few pages—“K is for KATE who was struck by an axe” and “R is for RHODA consumed by a fire” chief among them—are predicated on an ironic grisliness, but the spookiest Gashlycrumb Tinies passages are those where the ghastly developments are lurking just beyond the frame. Ida, reaching toward her reflection in an inky black lake. Victor, his darkened silhouette planted in the middle of train tracks. Most chilling of all is poor Hector, “done in by a thug.” Except for a pair of black gloves that mark the assailant as the macabre counterpart to The Lorax’s Once-ler, the thug’s horrifying dimensions are masked by a pair of Roman columns. What the mind attaches to those hands is far more terrifying than anything Gorey could’ve sketched. That power of suggestion made the illustrator simpatico with author John Bellairs, who first set to terrifying (and just as often inspiring) young readers by leaving more to the imagination with the Gorey-illustrated The House With A Clock In Its Walls in 1973. In typical fashion, the images Gorey provided for Bellairs’ initial foray into young-adult literature refrain from giving too much context. 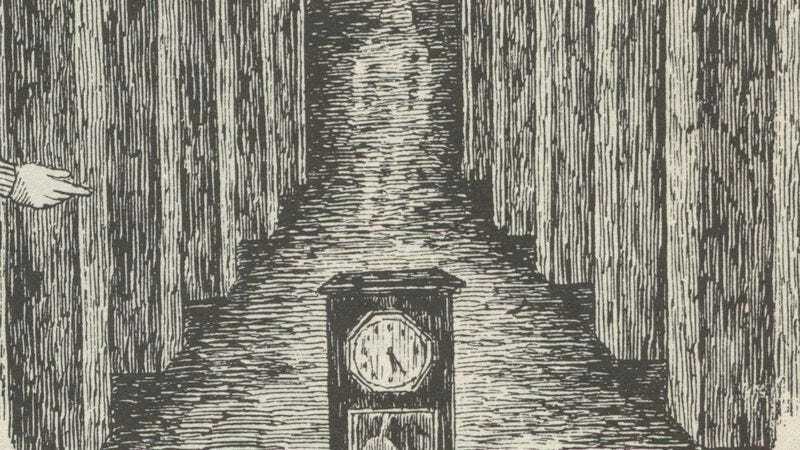 Though they depict several key, suspenseful scenes from Bellairs’ narrative—the emergence of two glowing orbs from a mausoleum marked only by the Greek letter “Ω,” the ominous pair of automobile headlights that give a visual echo to the orbs—Gorey’s contributions to The House With A Clock In Its Walls aim only to establish an air of foreboding, a quality shared with the untimely deaths of Gashlycrumb’s Ida, Titus, and Hector. That’s because Gorey’s art functions as support for a book that contains more words on a single page than the entirety of The Gashlycrumb Tinies, but the drawings are of a piece with Bellairs’ prose, which never spells out the horrors about to be visited upon its fictional Midwestern setting. Instead, it derives its impact from hinting at the cataclysmic intentions of the ancient evil unearthed by the novel’s protagonist, bookish 10-year-old orphan Lewis Barnavelt. I was the same age as Lewis when I discovered Bellairs’ work, at a time when young-adult literature was ruled by the likes of R.L. Stine and Christopher Pike. As Stephen Kings for the preteen and teenage set, their prolific output flooded libraries in the ’90s, causing waking nightmares for librarians and school-media specialists attempting to steer their charges away from such cheap, pulpy thrills. (But at least we were reading, right?) Near Halloween, when the small corner of Spencer Elementary School’s library devoted to paperbacks couldn’t hold an entry in Stine’s Goosebumps series for more than a few days, one such concerned soul recommended The Ghost In The Mirror—the first of several two-page outlines by Bellairs that were, with the approval of the author’s estate, completed by Brad Strickland—to a friend of mine, who later passed the book on to me. Like any preteen desperate to fit in with the crowd, I had taken a casual interest in Goosebumps, mostly borrowing friends’ copies of Monster Blood or Say Cheese And Die! and immediately flipping to the back to discover what terrible, unpredictable fate befell the latest kid to wander into Stine’s Twilight Zone. What I found within The Ghost In The Mirror, however, went beyond the fleeting shock of learning that the protagonist in Be Careful What You Wish For… ends up transformed into a bird. The ghost stories and supernatural mysteries Bellairs and Strickland laid out for Lewis, his friend Rose Rita Pottinger, and their counterparts Johnny Dixon and Anthony Monday never depended on jumpy scares or watered-down horror-movie tropes. The Ghost In The Mirror and the earlier entries in Bellairs’ bibliography build their chills patiently, with a slowly creeping sense of unease that, at the time, I was much too young to describe as “atmospheric.” The best of Gorey’s cover work for Bellairs encapsulates that atmosphere: Through muted tones and scraggly trees, Gorey conveys the characters’ shock as they turn a corner and stumble upon a dilapidated shack lit only by a jack-o’-lantern, or a grim, neckless specter with hollow eyes and a deteriorating trench coat. The homes Bellairs adopted later in life—New England and Minnesota—became the settings of the Johnny Dixon and Anthony Monday novels, respectively. And just like The House With A Clock In Its Walls, Johnny and Anthony’s first adventures introduced them as inadvertent explorers of the unknown, teamed with elderly mentors of varying experience in the realms of wizards, cursed figurines, killer robots, and other mythical entities that could be creeping up behind you at this very moment. An offhand observation about Lewis’ fear of tetanus even became one of Johnny’s defining traits, a bizarrely specific phobia that indicates the more-than-permeable barriers between Bellairs’ characters. Bellairs’ tendency to repeat himself aside, The House With A Clock In Its Walls still retains the power to spook by suggestion, all while allowing the atmosphere of a small town with dark secrets to unfurl from its pages like the “grainy, blowing mists” that envelop Lewis during a magical, mid-book diversion from his uncle, the jovial wizard Jonathan Barnavelt. Though their backstories were fleshed out in later books, much of the sense that anything can happen in The House With A Clock In Its Walls comes from the minimal explanation given to the magical powers possessed by Jonathan, kindly witch-next-door Florence Zimmermann, and the wicked sorceress Lewis accidentally raises from the dead, Selenna Izard. Magic is a fact of life in New Zebedee—not one Bellairs ever takes for granted (there’s always a sense of wonder about the tricks and spells Jonathan and Mrs. Zimmerman pull), but also not one he wastes any time weighing down in mythology. That could lead to a story composed of blurry lines and hazy descriptions, but the gothic details of the story—gothic in terms of subject matter and architecture, as New Zebedee is portrayed as a town of pointed arches and ornate monuments to the dead—plant the novel in steady ground and easily digested prose. That’s all the better to underline the horror of the apocalypse the resurrected Izard looks to bring about, a worldwide devastation that’s part Biblical prophecy and part author’s invention—one predicated on ominous cloud formations and the dreaded ticking of the timepiece mentioned in the novel’s title. The specifics may have been withheld out of concern for the book’s target audience—some closing passages about the unknown whereabouts of a few supporting characters and the origins of a Hand Of Glory suggest a touch of editorial euphemism—but these work in The House With A Clock In Its Walls’ favor, freeing the imagination to run wild off of the page. Having originally conceived The House With A Clock In Its Walls as an adult-oriented follow-up to his Tolkien-esque 1969 fantasy The Face In The Frost, Bellairs followed the advice of his publisher and reoriented the novel toward younger genre fans. The decision shaped the remainder of his literary career, but it also led to some of the book’s more curious—and occasionally moving—passages. As the new kid in town who’s more inclined toward reading the travelogues of John Lawson Stoddard than batting around a baseball, Lewis has trouble making friends when he comes to New Zebedee to live with his Uncle Jonathan. While temporarily hobbled by a broken arm, one of the school’s star athletes, Tarby, takes to shoring up Lewis’ athletic abilities, a kindness Lewis looks to repay by introducing the kid to Jonathan and Mrs. Zimmerman’s magical world. It’s in his eagerness to impress Tarby and retain him as a friend that Lewis brings Selenna Izard back to life. This chilling scene—which describes only what’s necessary about the spirit’s escape from its tomb—does a number on the supposed tough guy, sending him scrambling to the fringes of the novel, where he can safely betray his erstwhile comrade by lobbing insults like “fatty” at him. For all their grounding in the true terrors of childhood—uncontrollable emotions, not being accepted by your peers, being betrayed by a friend—these are the scenes that most mark the novel as a work of children’s fiction. Sophisticated notions on the nature of good and evil, nuanced storytelling, and expert world-building abound throughout The House With A Clock In Its Walls, but it’s still a novel where the final paragraphs strain against finality to keep the door open for future adventures in New Zebedee. Lewis wedges a mention of befriending Rose Rita into the book’s final paragraphs, conclusive proof that no matter its superiority over Goosebumps’ assembly-line chillers, The House With A Clock In Its Walls is nonetheless a product of the publishing industry’s most profit-driven sector. Yet there’s one more reason to argue for the importance of those later Lewis-Tarby scenes: They emphasize the fact that Lewis ultimately defies armageddon by using his brain. Failing to put an end to Selenna Izard’s plot by magical force, Lewis eventually locates the doomsday clock within Uncle Jonathan’s house using a series of nonsensical instructions that draw upon knowledge gleaned among the musty stacks in Jonathan’s library. That’s the type of twist we in the 21st century might label “fan service,” but before the era of box-office-busting superhero movies and a YA zeitgeist captured first by a boy wizard, then by hunky vampires, and then by a dystopia-defying heroine, the message that keeping yourself wrapped up in books could prevent the end of the world made a lasting impression. 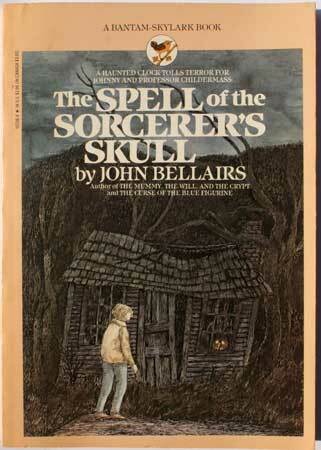 The imagery and atmosphere of Bellairs’ work inspired a previous generation of readers to become a new generation of writers: The John Bellairs Fandæmonium website collects testimonies from such fans-turned-authors; The Decemberists’ Colin Meloy recently dropped Bellairs’ name in an NPR interview about Under Wildwood, his second YA effort with wife/personal Edward Gorey Carson Ellis. It all goes to show that the art that most often sticks with us, the work that most terrorizes and tantalizes, is that which leaves room for the unknown and the unsaid, that which invites us back by leaving room to interpret what’s hovering just out of view.